Located in the Southern part of Vietnam about 700 kilometres away from Ho Chi Minh City, Quy Nhon is a must-visit in Binh Dinh Province. 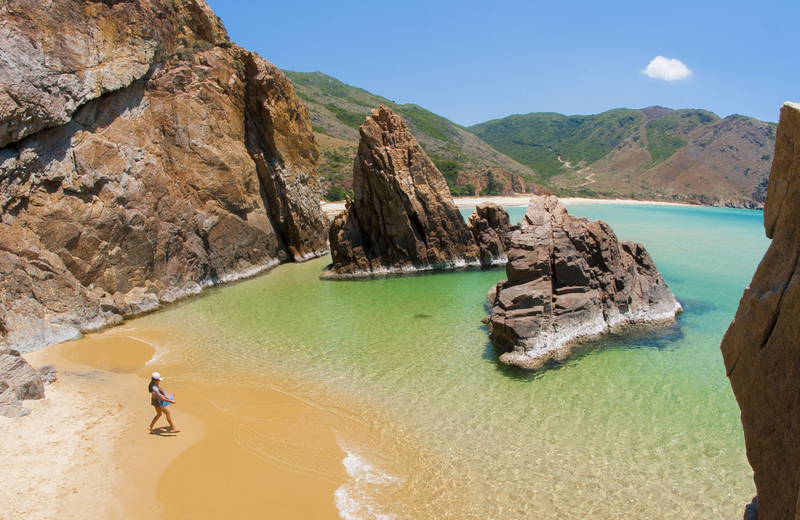 Despite being less popular than Nha Trang (Khanh Hoa) or Phu Quoc island in terms of high-end beaches and seaside resorts, Quy Nhon has its own charms and undiscovered sights that will blow your mind. The famous Ky Co beach that is only about 25 kilometres away from Quy Nhon was fondly named, by local tourists, ‘the Maldives of Vietnam’. 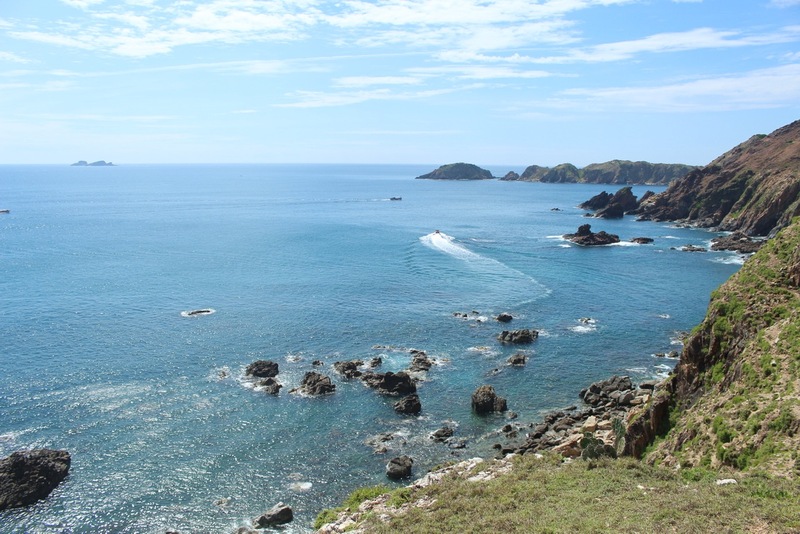 Travel from Ho Chi Minh to Quy Nhon to discover the top-rated attractions in Quy Nhon in a one-day itinerary below. Kick off the day with a stunning sunset view from Eo Gio – a curvy shoreline about 20 kilometres away from Quy Nhon, located in Nhon Ly region. 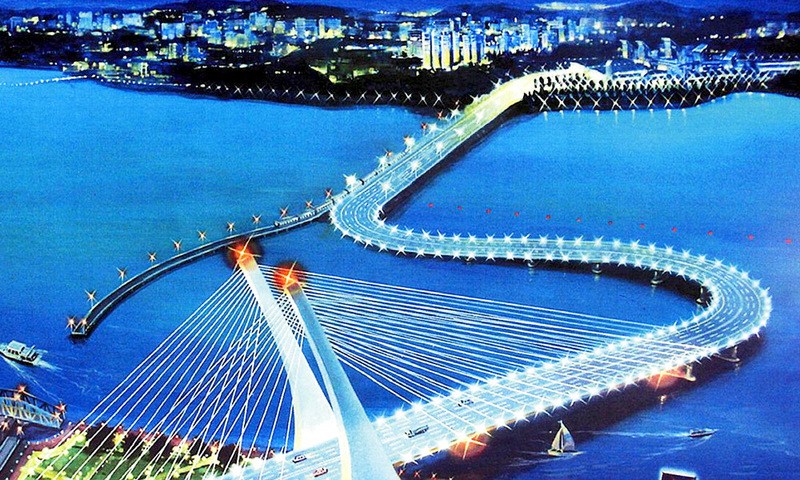 On the way from Quy Nhon city centre to Eo Gio, you will be passing by Thi Nai Bridge – one of the longest and most beautiful bridges in the area. Hike up the mountains to see the biggest female Buddha statue of Quy Nhon. 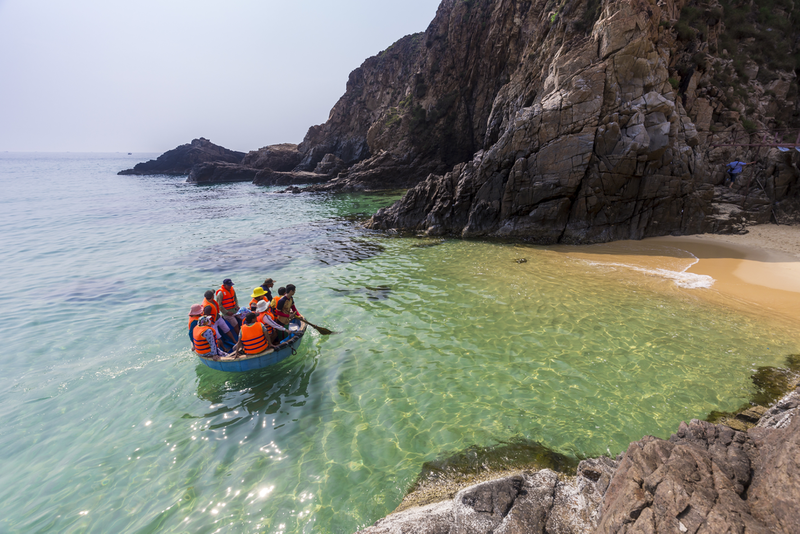 After breakfast at the nearby local market in the village, take a canoe to Ky Co – an untouched and less touristy beach of Quy Nhon also located in Nhon Ly region. Ky Co is surrounded by the ocean on one side, and the gorgeous mountain on the other. Thus, it is only possible to get here by boat or canoe. After about 20 minutes, you have arrived at one of the most beautiful beaches in Vietnam. The local people also refer to Ky Co as ‘the Maldives of Vietnam’. Ask your canoe driver to look for a diving spot to see corals before heading off to the crowded beaches. There are several hidden beaches in Ky Co as you walk along the shoreline, passing through mountain cliffs. After tasting the local cuisine of Quy Nhon (e.g. Banh Xeo/Shrimp pancake), head to a beach cafe in town (e.g. Surf Cafe) to immerse yourself in the slow and peaceful lifestyle at night of Quy Nhon, after the long day full of adventure. The city is lightened up, looking lively and vivid at night. 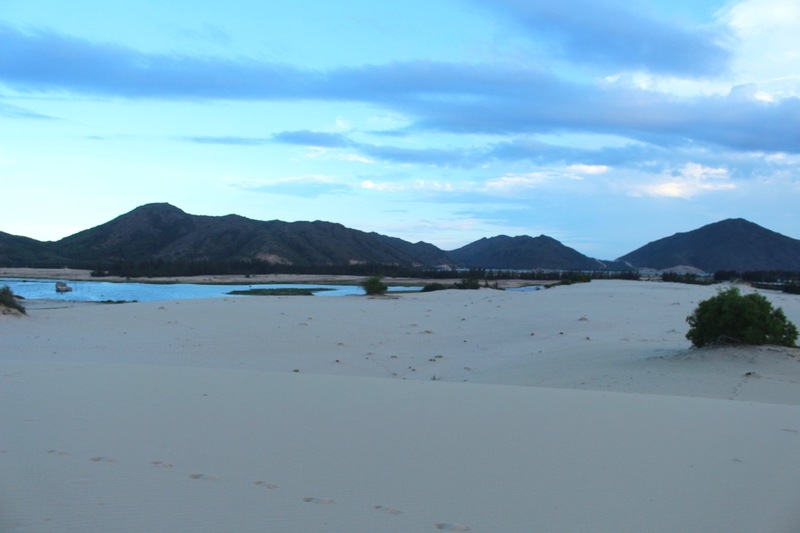 Quy Nhon Sand Dune: an undiscovered white sand dune in Quy Nhon, ideally as a sunset watching viewpoint. 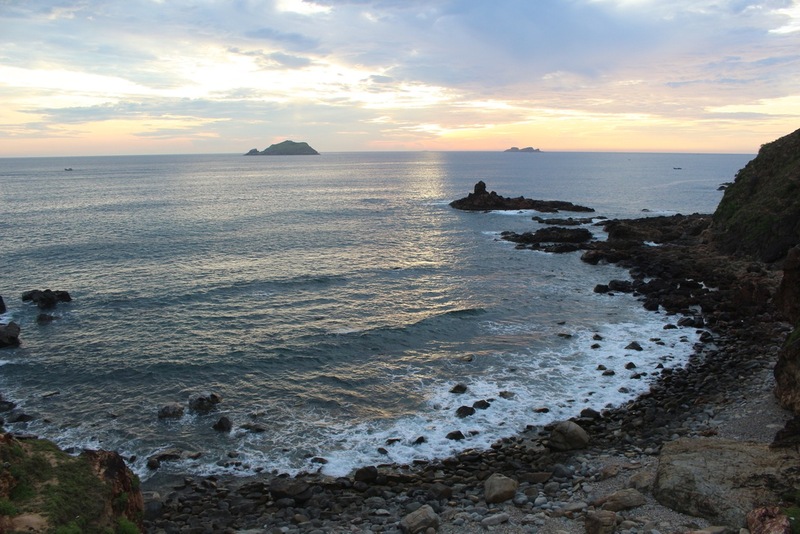 Ghenh Da Dia: another exotic beach famous for its rocks shaped like plates of dark colors within Phu Yen. 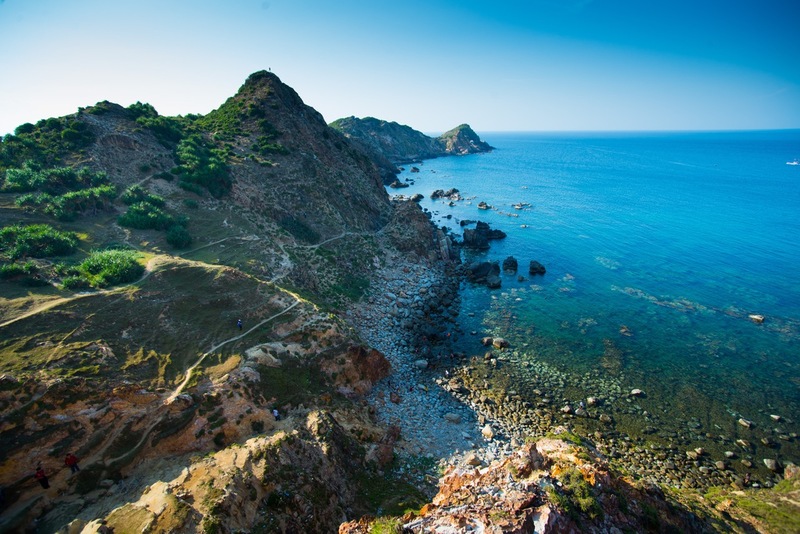 Cu Lao Xanh: Famous island ideal for relaxing by sunbathing, watching sunset and swimming. 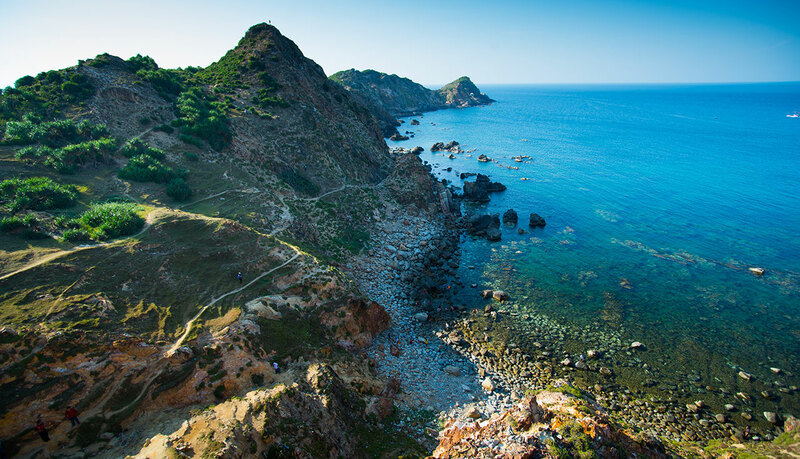 Bai Xep: another so-called Bai Xep beach in Phu Yen area, famed for being one of the filming locations of a domestically well-known movie ‘I saw yellow flowers on the green grass’, has also recently become a touristy spot. Flights: Quy Nhon can be easily accessed by flights via Phu Cat airport which is about 30 kilometres away from the city centre. 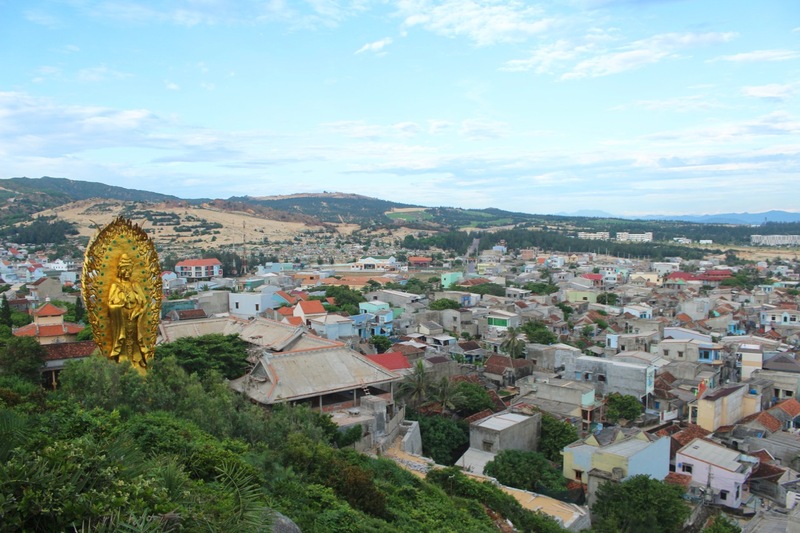 From there, you can take a taxi or airport buses to the central Quy Nhon. Vietjet Air operates many cheap flights from Ho Chi Minh to Quy Nhon and from Quy Nhon to Hanoi. Phu Cat Airport is a modern and small airport, making it fast for passengers to check-in and board. Train: there are plenty of trains departing daily from Ho Chi Minh to Quy Nhon. From Dieu Tri station, you can also take the train to explore nearby touristy towns such as Hue, Da Nang, or Nha Trang. 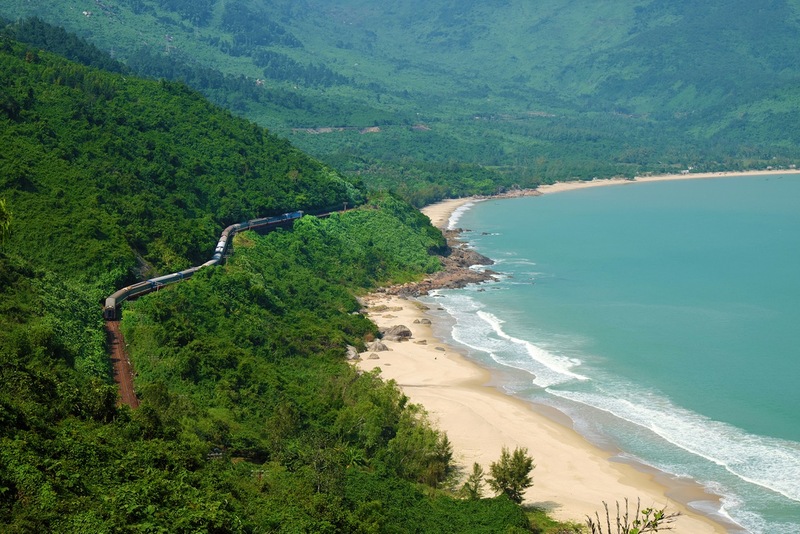 Also, there are also train connections to the undiscovered town of Tam Thanh, domestically well-known for the picturesque Mural Village within Quang Nam Province. 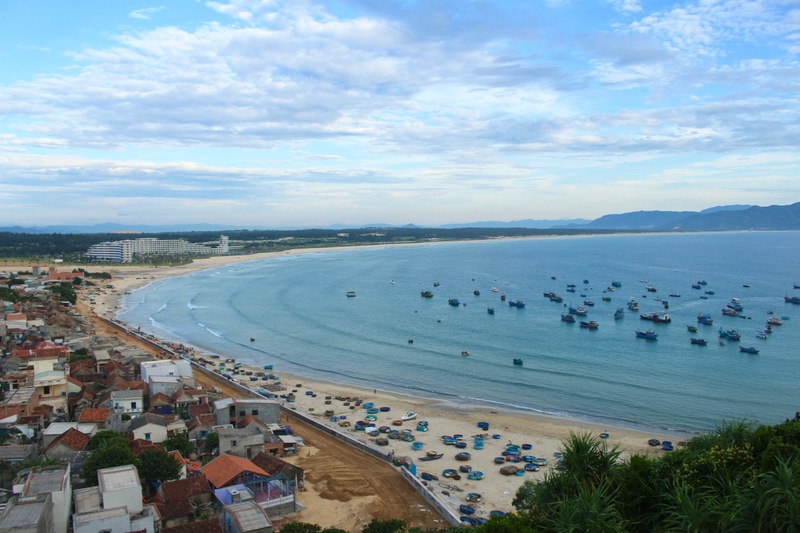 Bus: Bus from Ho Chi Minh to Quy Nhon is probably the most affordable means of transportation. Most buses to Quy Nhon leaves from Mien Dong Station. Be prepared for the approximately 14-hour long ride. There could be multiple buses leaving from Ho Chi Minh to Quy Nhon from Mien Dong Station in one evening, so you can always board another in the case of missing yours. The most popular and convenient way to get around Quy Nhon is to rent a motorbike for 100.000 – 120.000 VND (about 5-6USD) per day. Expect to leave your ID card and some deposit for the rental. It is also possible to rent a bicycle or an electric bike. However, if you want to see also the sights out of the city within Binh Dinh province, renting a motorbike or scooter is more recommended. Going by motorbike taxi (xe om) is also an option if you can’t drive. Baolau corporates with Vietnam Railways and various bus companies across Vietnam to service online ticket booking to Hoi An. 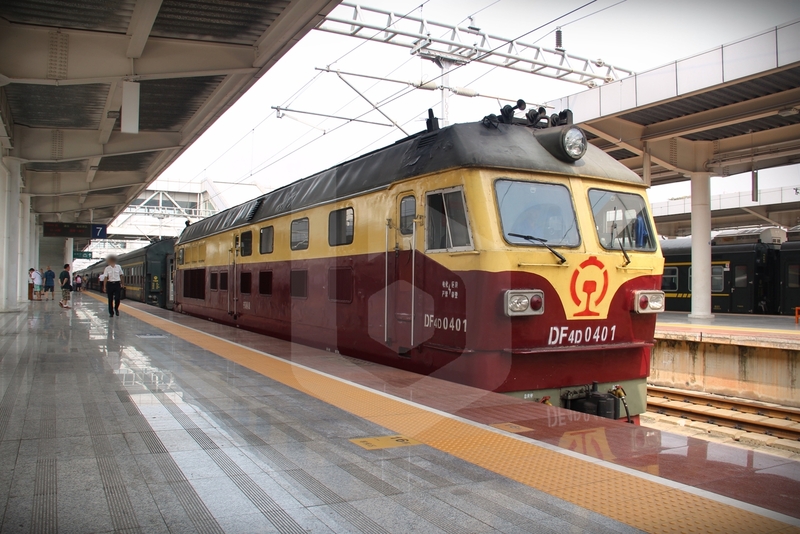 Baolau cooperates with Vietnam Railways to serve online ticket booking in advance. Once the reservation is confirmed, customers will receive an electronic voucher that can be used to check-in and collect the physical ticket at the station of any departure point. Reserve your tickets online in advance during holidays and festivals time as tickets are likely to sell out.